If, like me, you have been losing sleep lately wondering what the good people of Nevada will be wearing when they vote in their senatorial race in June, despair no longer. And if, like me, you spend an inordinate amount of time browsing news stories and being frightened by the growing evidence that clinical insanity must be pretty high up there in the job qualifications for running for elected office, feel free to continue to panic. Actually, I’m not sure where that will leave you in terms of panic. It might be a wash.
Bear in mind that the state election officials actually took a meeting on this. 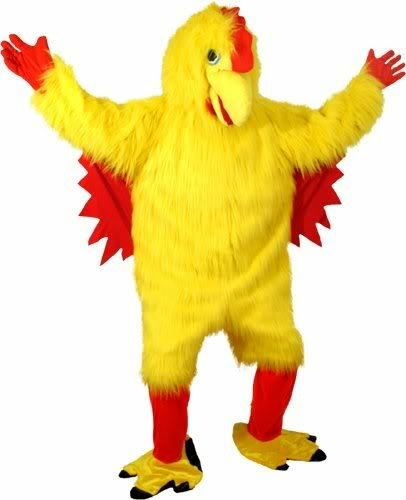 When the people of the state of Nevada go to the polls next month, anyone with the gall to be dressed in a chicken costume will be summarily turned away. Apparently, there is a perfectly good reason for this decision. When the Republican candidate, a former beauty queen named Sue Lowden, was interviewed and asked about the rising costs of medical care, she mustered up all of her former beauty queen brain cells and suggested that poor people should barter with doctors “like when our grandparents brought a chicken to the doctor”. The Democrats in Nevada got wind of this and did what any forward-thinking, responsible political party concerned with improving the lives of its citizens would do: They formed a caucus of community leaders and medical professionals and came up with a viable solution wherein every man, woman and child could have their basic needs for health care satisfied. Ha ha! Just kidding. Let’s not get crazy here; this is the government we’re talking about. No, what they actually did was to start up a website called “Chickens for Checkups” and hired people to appear at Ms. Lowden’s rallies in chicken costumes. Well. This got the Republicans’ collective knickers in quite a twist. They were afraid that the appearance of a person in a chicken costume might remind voters about Ms. Lowden’s being a dumbass thoughtful and insightful remark and make them vote for their opponent. There was no word on what might happen if someone walked in carrying an automatic weapon. An elected official was quoted as saying that if someone did, by chance, show up to the polling place wearing a chicken costume with nothing else on underneath it, they would be allowed to vote but would have to leave as soon as possible and would not be allowed within 100 feet of the polling place. This is probably not a bad strategy, actually. Personally, if someone showed up at an election I was involved with and told me that they were completely naked except for a chicken costume, the last thing I’d be worried about was who he was planning to vote for. On second thought, make it 200 feet.